In 2010 there was murmurs that British guitar music was dead as EDM was all the rage but four lads who resided in Camden were about to change that. The quartet who originate from the Midlands had been trapped in the North London pub circuit under different guises but it was when they channeled Pixies influences with a British twist momentum took over and Tribes looked and sounded like the real deal. 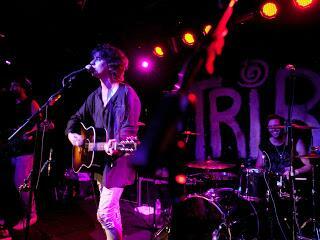 A support tour with Mystery Jets took the band out of NW1 and the word spread. They had perfected their live shows from constant gigging and hype brought expectation for a decent debut LP, and that is what they delivered. Baby, released in January 2012 which wasn't just one of my favourites from the year but it gained critical acclaim, the NME gave it a nine out of ten as it was jam packed with guitar heavy anthems that had nostalgia running through them. I challenge you not to sing-a-long to We Were Children, get emotional at Corner Of An English Field or divulge yourself in the riff heavy Sappho as they put gutsy rock 'n' roll back on the map. It wasn't just on record where the band attracted praise, their live reputation grew too, they became festival favourites as they worked their way up the stages, supported the Stones at Hyde Park and won over the hearts of many Americans. This was a band with huge potential. Four lads who loved music and loved their job, they were living their dream. After tireless touring in 2012 the band wrote the follow up to Baby, Wish To Scream which they recorded in the States and you could tell as it flowed with Americana vibes, ditching those grunge influences for a more rootsy edge. The album was delivered in May, I thought it was flawless, brilliant, the album to break them into the mainstream, some reason nobody else did. I still find it bemusing, why was Wish To Scream so misunderstood. It was full of heart and passion, several levels up from Baby, progression was evident, ambitious, bigger, braver but it seemed to be overlooked by everybody else, a real shame as it is, like Baby one of my favourites of the year. So, I was genuinely gutted when I heard the news that the band had called it a day. I'll cherish those tiny gigs in Camden and never let go of the band who deserved so much more in this cruel world that they call 'the music industry'. This follows the news of another of my favourites, Chapel Club who announced their split a few weeks ago, also receivers of the ' difficult second album' curse. I felt both had bright futures but a guess it shows how hard it is to 'make it' then even tougher to 'keep it'. Thank you Johnny Lloyd, Dan White, Jim Cratchley and Miguel Demelo for the good times and great tunes. Memories last forever. #music Taylor Swift - Has the Bubble Really Burst?